Say goodbye to unstable and unsightly disposable bottles around your sink by installing this Delta Classic Countertop-Mount Soap Dispenser in Chrome. With a stylish pump/spout above the counter and a 13 oz. refillable bottle below the sink deck, this fixture adds allure and functionality to your kitchen or bathroom space. It conveniently refills from the top with the included funnel, making quick work of replenishing hand soap, dishwashing liquid or lotion. All purpose push type dispensing valve is suitable for easy flowing liquid or lotion soaps. Removable inner soap reservoir for easy cleaning and maintenance. Lockable front cover. Attractive blue and white colour scheme. Completely concealed wall mounting (no visible mounting screws). The 707 manual liquid soap dispenser is made of robust high quality ABS and finished in an attractive white and blue colour scheme. 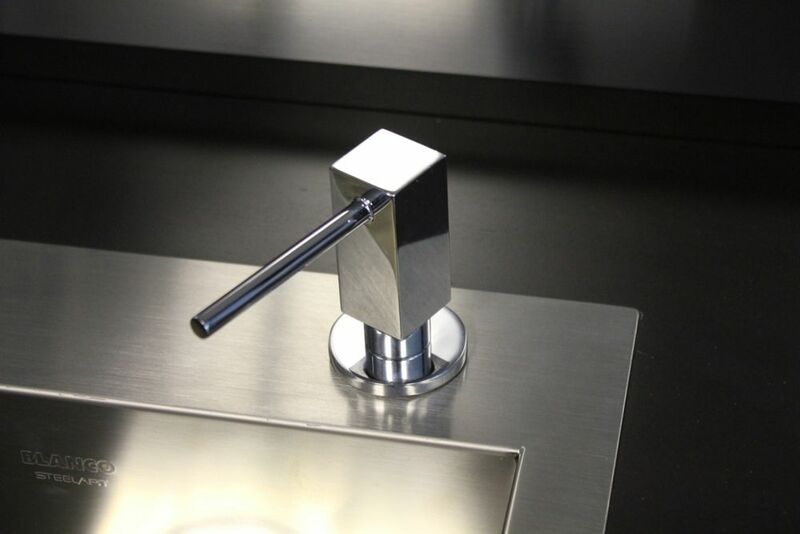 Quatris II Soap Dispenser, Chrome BLANCO soap dispensers are made of solid brass construction for exceptional durability and can be used to dispense liquid dishwashing/hand soap, and even hand lotion.